Unless you live in Iowa or have spent time living there, the small midwestern state probably only hits your radar once every four years. But it’s a gem in the midwest. Of course, I went to college in small-town Iowa and loved my four years there immensely, so I’m not unbiased. While the state has a population of just 3.1 million — Illinois, its neighbor, has almost 13 million — it’s a state that has a robust literary scene and history. Rather than consider it little more than “flyover” territory, why not take a drive through and stop at some of the fun, unique, and rich centers of literary allure? In addition to talking about places to visit, I’m going to offer up a handful of recommended titles to read along the way, too, to add even more depth to your Iowa experience. Fun fact: Iowa City — home to the storied Writers Workshop at the University of Iowa — is the only US city to be designated as a UNESCO City of Literature. Cities selected have to meet a series of qualifications, including being a center of literary tradition, having libraries and bookstores that play a role in the city’s culture, and having programming that promotes a literary life and understanding, among other things. One of the requirements of this honor is that the city works to build public/private partnerships in order to build a rich creative enterprises. Iowa City’s bookstore scene is great, thanks in part to Prairie Lights. Located downtown along the Pedestrian Mall, Prairie Lights is an indie bookstore jam packed with both the newest releases, as well as harder-to-find and smaller-press titles. More than a bookstore, though, Prairie Lights offers up a ton of author readings and events. The store used to be home to a literary society, as well, which hosted authors like Carl Sandburg, Langston Hughes, ee cummings, and more. It’s a bookstore for bookstore lovers. After a trip through the bookstore, go for a stroll along the Literary Walk. Along both sides of Iowa Avenue, from Gilbert to Clinton Streets, are bronze panels celebrating the words and works of 49 authors who have Iowa connections. All types of writers are included, with quotes from those who wrote memoirs to children’s book authors. Some of the authors are well-known, like Flannery O’Connor and Kurt Vonnegut, and some are lesser-known. It makes for not only a fun walk, but it’ll add more authors to your to-be-read pile. Perhaps you want to do this walk before going to Prairie Lights, so you can better plan out your spending. Iowa City also hosts an annual Book Festival in the fall, which runs for four days and features author events for every type of reader. This year’s festival will run October 1-4. Take a quick trip to Coralville to round out the literary fun in this part of Iowa. Located just outside of Iowa City, Coralville features the Iowa River Landing Sculpture Walk, a collection of 8 permanent literary-themed sculptures. Each of the sculptures was made by an Iowa artist in honor of one of the books housed in Iowa Writer’s Library (which is itself a destination — you can see books written by the students and teachers who have gone through the Iowa Writer’s Workshop). You can see the visualized works of A Thousand Acres, God Bless You, Mr. Rosewater, and Gilead, among others. Truth & Beauty by Ann Patchett, on the experience of living in Iowa City during the 80s with friend and fellow writer Lucy Grealy. The Oxford Project by Stephen Bloom and Peter Feldstein, a photography/story project set in a small town about 20 minutes northwest of Iowa City. Fans of Star Trek may know this, but Riverside is the future birthplace of Captain Kirk. While it seems like an odd spot for literary tourism, it’s not; it was in creator Gene Roddenberry’s book The Making of Star Trek where the statement was made. The small town of Riverside took to this and decided to own the designation. There’s a marker when you enter the town to welcome you. Legend has it there are more infamous places around town where you can explore the Captain’s future home. In 2008, the city of Cedar Rapids experienced massive flooding. Since it happened downtown, a number of the city’s biggest institutions suffered significant damage, including the main branch of the Cedar Rapids Public Library. Five years later in 2013, a brand new downtown library was built, and it’s been earning awards and accolades for its design and sustainability features. The library boasts a huge auditorium for programming, a collection of almost a quarter of a million items, and a 14,000 square foot children’s library. For a public library in a city of 129,000, that’s really impressive. This is a public library worth wandering around. Something special about Cedar Rapids downtown is the unique Czech Village. Here you can visit the Czech-Slovak Museum, visit Czech stores, and eat Czech food (including delicious and authentic kolache). It only makes sense to recommend two Czech cookbooks — the first from Cedar Rapids itself. If you’re a fan of Laura Ingalls Wilder, you can find some kind of museum or monument in most of the states of the Midwest. Iowa is no exception. Located in Burr Oak, you can visit the Laura Ingalls Wilder Park & Museum, which is where Laura grew up as a child. It’s on the banks of the Silver Creek, and where Grace was born. There are tours of the Master’s Hotel where Laura and her family lived, and there’s an additional visitor’s center to learn more about the family and their story. If you happen to be in the area during the fourth weekend in June, you can also take part in the annual Laura Days celebration. Little House on the Prairie series by Laura Ingalls Wilder for obvious reasons. Old Town in the Green Groves by Cynthia Rylant, a book about Wilder’s life that fills in the gap of time when she and the family lived in this area. It’s not an official part of the series, but it fills in some blanks via historical records. The capitol city of Iowa isn’t as literary as Iowa City, but there’s still some exploring worth doing around town. For bookstore lovers, stop by the independent bookstore Beaverdale Books. One of the features of the store is its roster of events, including a mystery book club that’s been in existence for 20 years — pretty impressive! For those who prefer their bookstores packed with used titles, Plain Talk Books and Coffee in the East Village should be a stop on the trip. And of course, those who can’t resist visiting a library, you have a few to choose from in the Des Moines Public Library system. Starting again in 2016 after a brief hiatus, the Wonder of Words festival will offer up a book festival in the city. There’s not a lot of information available, but it looks like the sort of event to keep an eye on for next year. The Life and Times of the Thunderbolt Kidby Bill Bryson, a memoir about Bryson’s childhood growing up in Des Moines. He is, of course, an Iowa National Treasure. State Fair by Phil Stong, from which we’ve been granted more than one film rendition. To round out this literary tour through Iowa, it would be a mistake to overlook the infamous covered bridges dotting Madison County. Located just southwest of Des Moines, visitors are welcome to take a self-guided tour or take part of something more organized. Of course, readers know the reason this spot makes the Iowa list of literary landmarks worth visiting. It’s the setting of The Bridges of Madison County by Robert James Waller, one of the 20th century’s best selling novels, with a whopping 50 million in sales, as well as a movie and a stage production. Any trip through Iowa without a stop in the countryside isn’t one worth taking — it’s here from which so much of the literary richness of the state grows. 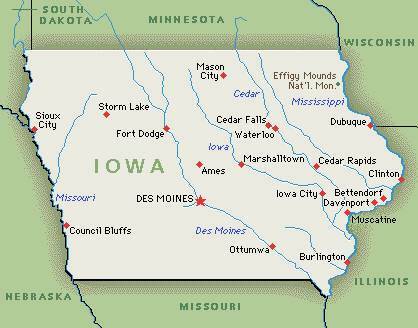 Want to read some books set in Iowa? We have a booklist for that.